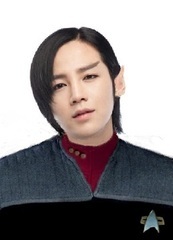 Commander T'Klome is the executive officer of the USS Nemesis. Physical Description: Tall and lean. Broad frame. Twice the strength of an average Humanoid. T’Klome graduated from the top of his Class at Starfleet Academy with flying colors. He was especially adept in Psychology, Counseling, and was proficient in his knowledge of the minds of others. Served aboard the U.S.S. Gilgamesh in his first tour of duty until being eventually promoted to Petty Officer in 2373; in which he during this time had assisted his Captain in a negotiation with an enemy ship, which was not going well prior. He had served aboard two other starships; the Risktaker and the Archipelago, gaining two more commissions until he was promoted to Lieutenant Commander. T’Klome’s ability to talk to others made him a key diplomat during the Dominion War. While his exploits were not on record, (They were made top-secret to avoid attention and enemy intelligence probing) this prodigal talent attracted the attention of Section 31. He was tested and probed by the organization through Memory implantation, Holographic imagery, and interrogations. He passed all of them, and was inducted into the organization shortly before Luther Sloan’s disappearance. Section 31’s influence within Starfleet Intelligence has allowed T’Klome to be assigned to the U.S.S. Nemesis; which is secretly being investigated by Section 31 on the grounds of a potential traitor that could transmit information and schematics of the new technology it has been outfitted with to the enemy. It’s protection is crucial; For if the Nemesis falls, the consequences would be disastrous for the Federation's defense of the Gateway Sector perimeter. T’Klome is also to covertly gather any and all information referring to the Guardian of Forever or its internal mechanics. His status as First Officer and talents of interaction with others is precisely why he was chosen to be Section 31’s eyes and ears within the Gateway Sector. 2368: Inducted into a Cadet group called the Group of Ten, an advanced diplomatic/debate research group. 2369: After receiving a commendation for outstanding marks in the fields of both Counseling and Diplomacy, is allowed to serve for one week aboard the U.S.S. McCoy as Acting Counselor. 2370: Graduated Starfleet Academy; Assigned to U.S.S. Gilgamesh. 2371-2373: Promoted to Petty Officer in 2373; Assisted (Off-The-Record) in the negotiations that ended the Battle of Onarsus Four during the Dominion War. Transferred to the U.S.S. Risktaker a month therafter. 2381-2384: RECORD FILES FOR THE FOLLOWING STARDATES ARE MISSING. ADMIRAL-LEVEL CLEARANCE OR HIGHER REQUIRED FOR RE-FILING. Hobbies: T’Klome often enjoys music, and can be seen playing his Vulcan lute; which was a memento passed to him by his sister T'Laas. Also a fan of mysteries and crime novels, primarily the works of Sherlock Holmes and an ancient Earth show called “Law and Order.” His authority as Acting Counselor often causes him to be the Mediator of disputes aboard the ship; though lacking the authority of a Security Chief. Personal Traits: T’Klome is a “loner,” often choosing to stay on his own instead of truly socialize with everybody. Is very proud of his Vulcan heritage, and adheres to its customs persistently. While an overly logical person; which would steer most away, many people often come to him for advice. (This prompted his Captain into promoting him to Acting Counselor, as the previous Counselor had been transferred from the ship and Starfleet is being oddly slow on sending a replacement for reasons unknown) T’Klome feels somewhat close to the crew of the Nemesis, and as a result regrets not being able to tell the crew of his orders from Section 31. (This is also another reason he prefers his privacy) Despite his “lone wolf” attitude, a few of the crewmembers are close friends with him; as they are mostly seen engaging in his mystery simulations.